Today, I managed to find a diary hidden on one of the mbots we have at the office. I couldn’t see it in the user interface, but when I was doing some maintenance on the robot a simple ‘ls -la’ command in the terminal showed me this hidden content. It was so cute that I wouldn’t want to keep it from you! 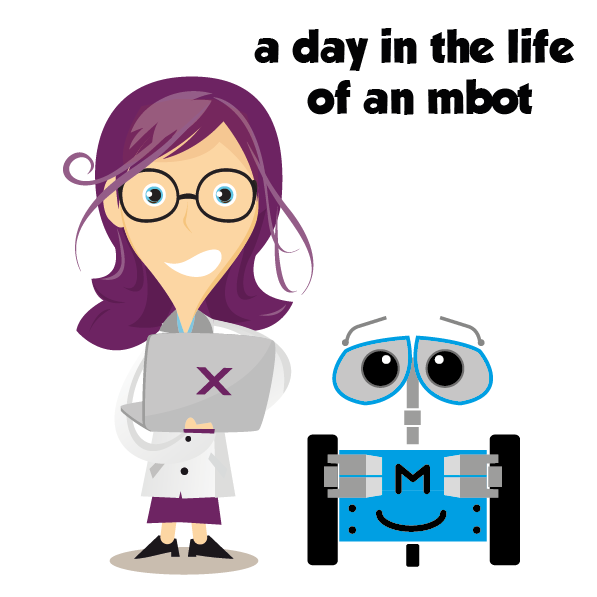 The robot is writing about a workshop my colleagues and I facilitated for ING. Stay tuned for a report about this day written by an actual human: my colleague Erik Zeedijk. This must have been one of the most exciting days of my life; I got to meet so many new friends! It all started very early in the morning. I was put in my box and transported somewhere. I was very scared, since I was locked up in my box for quite some time…. When the humans finally turned on my power and I could open my eyes, I saw a very big room. I also saw that I was not alone: I counted 19 brothers and sisters! That made me very happy and I was very curious and excited about what the day would bring. Another human was so kind as to update my firmware and then I waited. I had a nice chat with three brothers that were put on my table as well. At around 11 in the morning, a group of people gathered around me. They were smiling at me and started exploring my features. After an hour they uploaded some code to me and put me on a track with black lines. At first, their code was very scary and I got lost, but after a few tries their code improved and they made me follow the track with black lines all the way to the end. They even made me do a dance and play music! That was amazing. I had a great day. I could chat with my brothers and sisters, dance together and laugh together. At the end, the humans turned me off and put me in my box again. I hope that I will experience a new adventure really soon!